Entry filed under: Podcast / Radio Show. All New – Spring Break ideas, Sleeping Better tips and Movie Reviews	LIVE and in person with Pat Hrabe, creator of Hey, Shipwreck! One of the best things about COMPASS is the Healthy Communication portion which is ALWAYS taught by a Chaplain. They help us to realize that there are things that are different between the way women and men communicate. We also discuss the different cycles of deployment. It helps us to be able to recognize them when they happen and know that it won’t last forever. 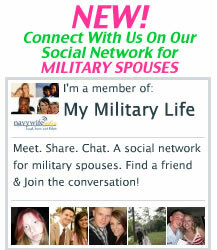 The experience and ideas that you get from the COMPASS course are invaluable if your spouse decides to stay Navy! I wish they’d had this course 20 years ago when I was a young spouse. Our goal is to help everyone so that whatever path they head down that they have knowledge and skills to make that journey successful. There are those who will leave the Navy because their family is unhappy. If we can arm them with the tools they need to cope, we as a Navy will be able to retain those who can make a difference. I love listening to your show. Keep up the good work Be sure to go to COMPASS! when you get the chance. The time commitment is definitely worth it.